The following excerpts will validate our view that the Market Trend is up, and all pullbacks are buying opportunities. Now you know why we defer to our trend indicator. One cannot rely on old time tested tools if the market conditions are not stable and almost all the data one relies on is fraudulent in nature. It is now common knowledge that the primary driver of the markets is the money the Fed is pumping into the bond markets. This has pushed interest rates so low, that corporations have borrowed money like a drug addict desperately seeking a fix. The latter is dependent on the former; if rates were high, corporations would never borrow such vast sums of money to support the massive share buyback programs that have been put into action for the past few years. V readings jumped to new highs again; the markets are overbought on the short term time frames, so the high V readings mean we could see a quick pullback and then a move up to new highs. Until the trend turns negative new highs should be expected. As many technical indicators are not supporting the current move to new highs, we think the speed at which the market trades higher is going to slow down a bit. The market is likely to drift higher rather soar upwards unless the picture changes dramatically. The smart money continues to sit on the sidelines, and the current move to new highs is not being validated by this group of astute investors. If you look at simple indicators such as RSI and MACD’s you can plainly see the host of negative divergences in the above one year chart. You will find a similar pattern in two and three-year charts. Today this means nothing and trying to use such tools to help you decide when to get in and out is dangerous as manipulation is the only reason these markets are soaring higher. However, used in conjunction with other indicators, such simple tools can still provide some useful information as to when a market is overbought and oversold and then depending on the trend you can decide what position to take. If the trend is up, then opening up long positions during pullbacks would be the way to go and vice versa. Over the past few years we have come up with modified versions of the RSI (our RSI indicator also has moving average built in), modified MACD’s, etc. , etc and even though many of these once very accurate indicators are generating negative divergences we are not paying too much attention to them as the trend has not turned negative. Other than the trend psychological data that is not easily understood has proved to be useful, for example, sentiment data, most individuals ignore the number of people that are neutral and focus only on the bulls and the bears. The neutral numbers in some instances are more important than the other two figures. It appears that key psychological data can be as reliable as the trend indicator. In this instance despite a host of factors pointing to a market correction, the markets after a small pullback rallied sharply. 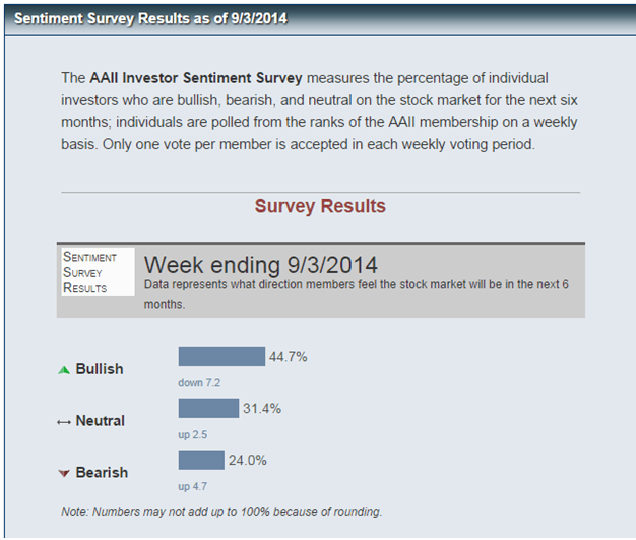 Let’s look at the AA latest sentiment data as it can be another source of useful information. While the number of bulls has jumped since we last looked at these figures, they are not at an extreme level yet. When we combine the Neutral investor with the bearish investor, the overall number is still higher than those that are bullish. This means that there is still room for this market to run, though if it does not let out some steam again, the pace at which this market moves up will slow down. Let us examine several secondary indicators/tools to see what they might be saying. 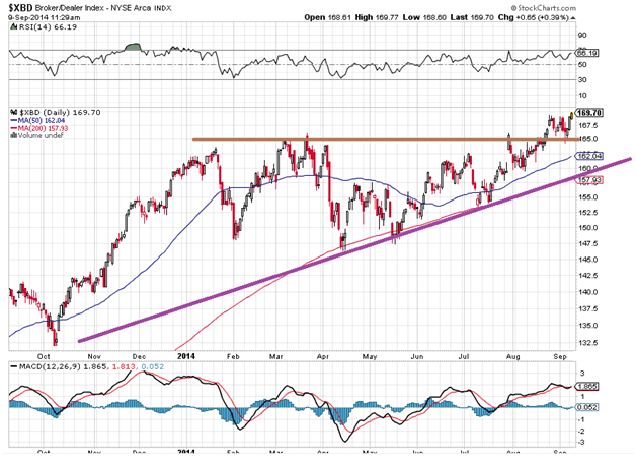 It was showing signs of pulling back, but it appears to have found support at 165 and is now trading at new highs. This is a contrarian indicator so extreme numbers are viewed through a bearish lens. 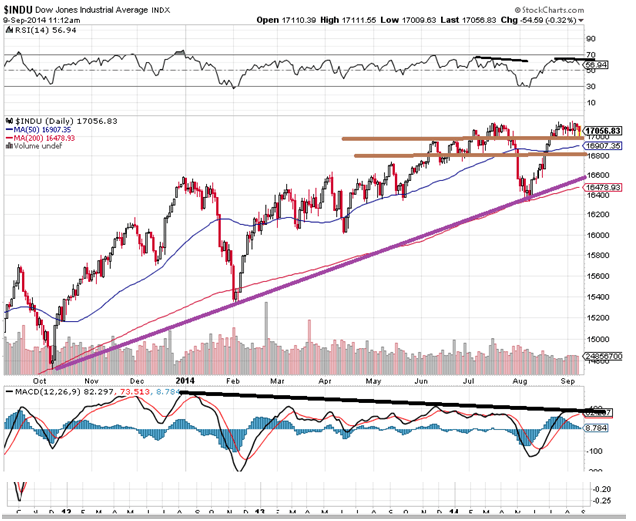 As the trend is positive, we can expect it to continue putting in new highs. The next targets fall in the 173-175 ranges. However as this indicator is in the extreme ranges on the short term timelines and that markets are very overbought, we would not be surprised if the markets and this indicator pulled back again before moving to new highs. On its own, this indicator is clearly stating that brokers, in general, are way too bullish and that a sharp correction is needed to rebalance the markets or find a new equilibrium point. 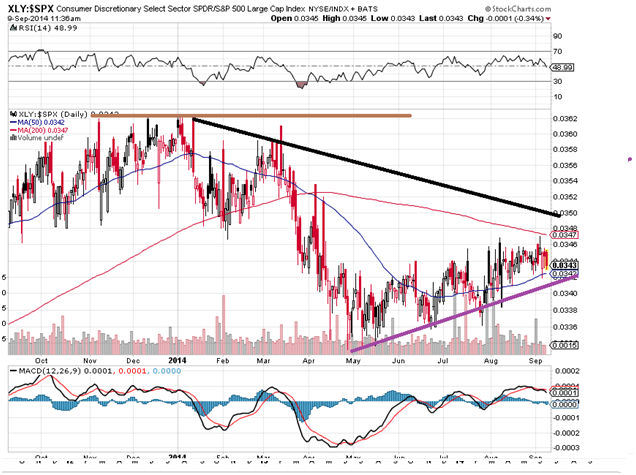 However, as the trend is positive, a strong downward move is unlikely till it turns negative. You can see how twisted things are; in the past, if this ratio moved past 1.00 it was considered high, but it has been rising since 2009, and it currently stands at a whopping 2.98; extreme would only not justify what is going on. 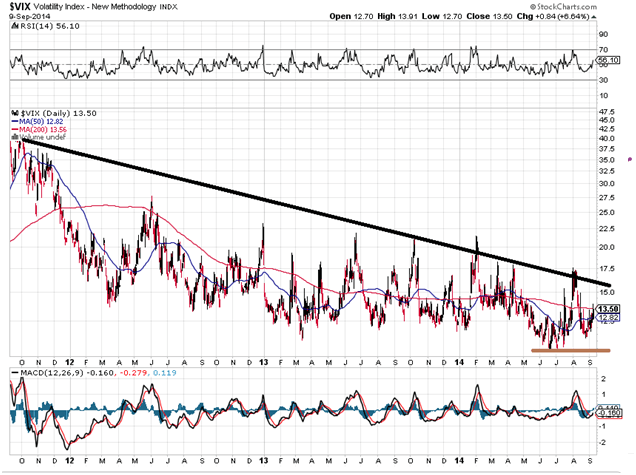 This ratio has been pushed way beyond the higher upper limits due to the Fed’s so-called market propping program. So while this indicator used to be reliable in the days gone by, it can no longer be trusted on its own; it can be used to tell you when a market is overbought or oversold when used in conjunction with other indicators. One way to use this tool would be to look for negative a divergence and then use the pullback to open new positions and vice versa. However, for those traders trying to spot market tops and short aggressively, this indicator is no longer useful. Once upon a time, VIX readings in the 15-20 ranges were considered extreme, but today a reading of 10 is no big deal, and we are not sure that the Low set in June of this year will hold. Again this indicator like the one above clearly illustrates that markets are no longer operating normally. However, as we have stated time will come when these indicators will operate normally, but those in charge will wait till many forget how to use them, and then suddenly these indicators and tools will make a comeback. The last time we looked at this chart, it looked far worse. This chart examines the strength of the cyclical sector about the SPX. 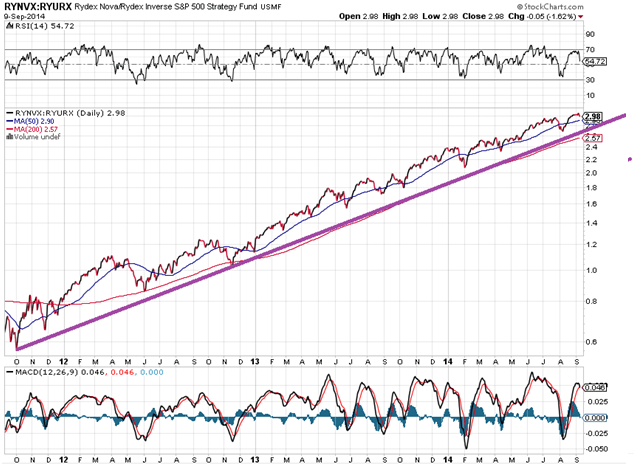 As of late, the picture is improving, which suggests that the current rally has some legs to it? Cyclicals have strengthened about the SPX, and if the primary downtrend line at 0.035 is taken out, it will be the first signal that the SPX is ready to test the 2100 ranges. All in all, this chart paints a bullish picture in the short term timelines. A breakout past 0.035 would turn the outlook on the intermediate timelines to bullish. As the trend has now turned bullish again, there is a high likelihood that we might have to wait till next year for the corrective phase. September is the worst month of the year, and so far it has been a dud; it could suddenly take a turn for the worse, but if the trend is positive then every pullback is going to serve as a buying opportunity simply. 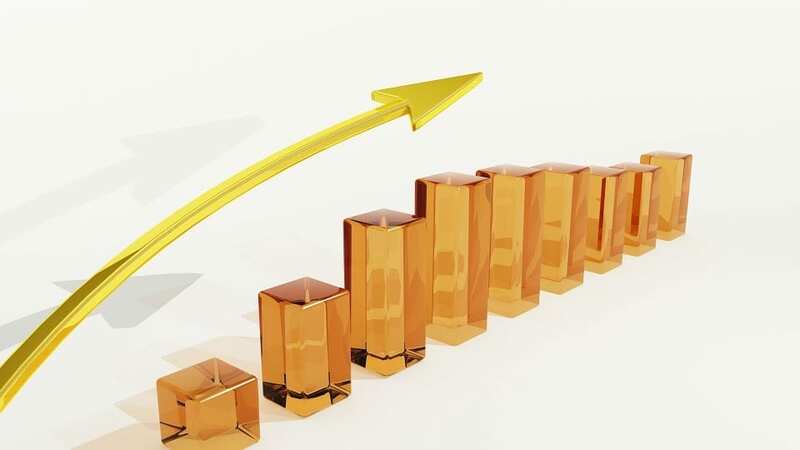 While there are several indicators that are flashing warning signal, one of which is the very accurate smart money indicator (smart money is not confirming any of the new recent highs), the trend has turned positive again, and so we must ignore these secondary indicators and focus on the trend. As Long as the Trend is up, all pullbacks should be viewed as buying opportunities. The stronger the pullback, the better the opportunity. From a long-term perspective contrarian, investors might want to take a look at stocks in Russia, Argentina and China; we see some long-term patterns bullish patterns taking hold in Russia, Argentina and China.